A boss should never be bribed with a gift or a meal but with a decent thank you card, one can never go wrong. The boss should be thanked about his role in defining your career and improving your skill set. You should clearly state how much you respect him and his style of leadership and that you consider him to be your mentor in your career. An inspiring quote or any funny incident involving you both can be career lighten up the mood. The language should be kept formal and the Thank You Note should clearly state the respect you hold for your boss. 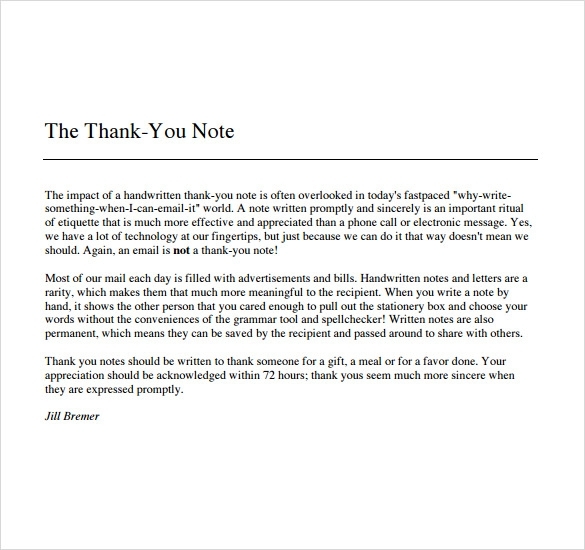 Impress you boss with these easily downloadable thank you notes available in word and pdf format. Writing a thank you note to boss is critical as it has to be framed with the right choice of words to convey gratitude in the right sense. 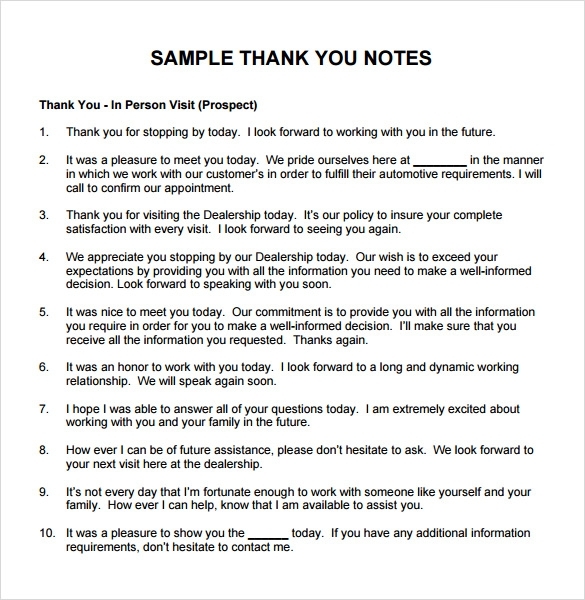 Sample thank you notes help in framing a formal letter of thanks for an employer that conveys an employee’s appreciation towards his employer. 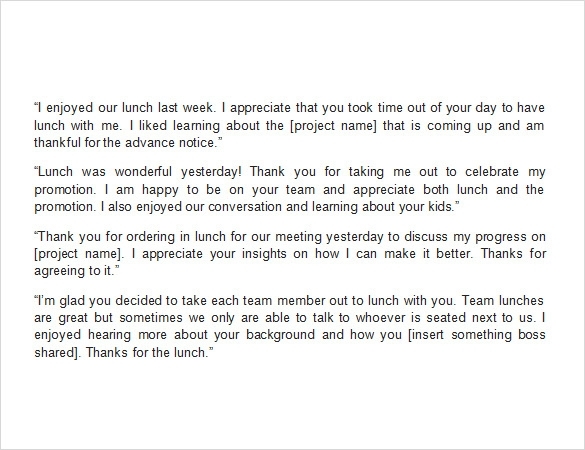 There may be a time when an employer invites his subordinates to join him for a meeting followed by lunch or simply at lunch hour to celebrate the success of a project or fixing a major deal, en employee writes a thank you letter to boss for lunch. When an individual gets shortlisted for an interview, be it external or internal, regardless of him being selected for the job or not, the individual must send a thank you note to boss for the interview. It increases a candidate’s chances of selection by bringing him in front of the boss once again. Why do you need Thank You Note to Boss Download for Free? There are a number of reasons to write a thankyou note to boss. Whether the reason is personal or professional, a thank you letter must be formally written to en employer with the right choice of words. Sample Thank You Note can be written to show thankfulness upon receiving a new project, being included in core team of a dream project of company, for an individual’s promotion, a good ranking in monthly or annual report, an exceptional increment, or could be as simple as guidance received from the boss in doing a particular task. When do you need Thank You Note to Boss Download for Free? If you think a thanksgiving is not really important in professional world, you are sadly mistaken. Even if one is performing his duties with sincere intention, thanking one’s boss helps in the long run as boss or a manager has control over the annual confidential reports, extra benefits, amenities or perks of an employee. Thus, an employee requires writing a thank you note to boss as words of appreciation are a boost for an employer’s just like they are for employees in an organization. An employer guides his employees in the right direction and hence must be thanked for his efforts. Thank you note to boss can be framed with the help of thousands of examples of thank you letters available online for free. A thank you note, whether sent through email or handed over personally, makes a boss realise that his employees are satisfied with the work conditions in an office and respect him for his leadership qualities. It gives the employer an assurance that his employees are geared up to follow the instructions given by their boss and are committed to put in sincere efforts to contribute towards overall profitability of an organization. 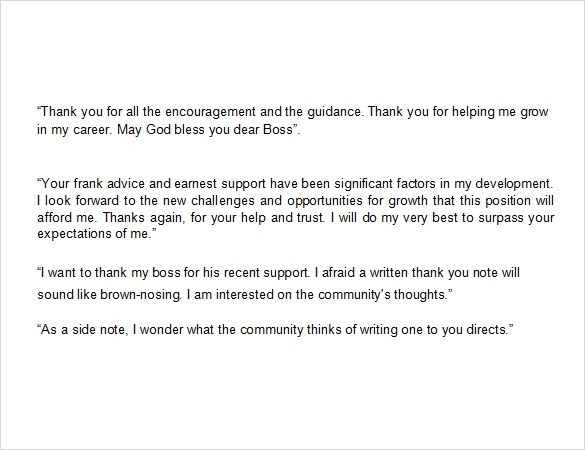 Thank you note to boss is written in order to recognise an employer’s efforts in keeping an organization keep growing. It thanks the employer for putting the needs of his or her employees ahead of his own and converting employees’ strengths to productive results.